I’ve been a vegetarian for over 15 years and my vegetarian lifestyle wasn’t about to stop when I became pregnant and had my first kid. But, in retrospect, I realize that I was a bit too idealistic about raising a vegetarian child. While it isn’t difficult per se, it would be naïve and immoral of me to say that it was easy. Vegetarian parents need to realize that their children will be segregated from mainstream society and nutrition may be a constant battle. There is nothing healthier for an infant than mother’s milk. When the mother is healthy, then breast milk will provide all the nutrients that a growing infant needs. The World Health Organization recommends that infants only drink breast milk for the first 6 months of life, and only after that should solid foods be introduced gradually. Note that vegan breastfeeding mothers MUST take a B12 supplement. This is because B12 reserves from the liver (where B12 is stored) do NOT make it into breast milk. The vitamin must come from food or a supplement. In the ideal world, every vegetarian mom would be able to stay at home with her infant and breastfeed on demand. However, the world is far from ideal. Maternity leave is often only 3 months, which means that infants have to switch to formula and vegetarian moms have to find a way to pump milk at work (and work isn’t always the most breast-friendly environment!). Talk to your boss about your breast pumping needs. If it is a male, he might get red in the face, but he will probably happily find a quiet place for you to pump. Invest in a good pump. You will be using it a lot! Breastfeeding is best, but don’t feel guilty if you decide to switch to formula-only. Every family has to decide for themselves what is best! Both the American Dietetic Association and the American Academy of Pediatrics agree that a vegan diet can meet all the nutritional requirements of a child. However, they do stress the fact that foods must be chosen carefully and supplementation may be necessary. Even children who are still breastfeeding may need an iron, B12, and vitamin D supplement. When kids first start eating solid foods, it is exciting for them – so they aren’t likely to be very picky (yet). Take advantage of this period by introducing kids to healthy foods like lentils, spinach, and whole-grain cereals. Infants and young children have higher nutritional demands than adults, so don’t assume that your child is getting adequate nutrition from the foods he or she is eating. Talk to your child’s pediatrician to make sure your growing child stays healthy! There are plenty of organic, vegetarian baby foods available at health stores. Making your own vegetarian food isn’t difficult though (and it is much cheaper). About twice a week, I would spend a few hours boiling various fruits, veggies, and grains (separately) until they were soft. Tip: Save the water as a nutrient-rich drink! Mash each fruit and veggie into a puree and then put each into its own separate jar. At feeding time, I would mix a few scoops of puree together (like lentils, apple, and brown rice for dinner) in a cup. Make sure to use a clean spoon each time you take food from the jars so bacteria doesn’t grow! I heated the food by putting the cup in warm water. You could use a microwave though for an even easier solution. Instead of putting the pureed food in jars in the refrigerator, you can put the puree in ice cube trays (even better, use popsicle trays). Then, just defrost before feeding time. The food can last up to 3 months this way. Here is a good guide to making your own baby food. If you don’t let your baby know about the world of refined sugars and sweets, then it is fairly easy to get your child to eat healthily. 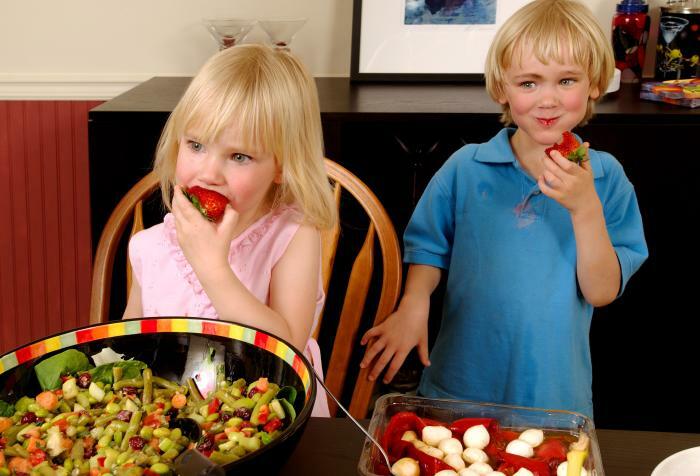 However, children eventually catch on to the fact that there are much tastier foods than figs and apples out there! In my case, this happened when grandma started slipping my daughter candy bars. Even if a toddler never gets a taste of candy, most kids still typically become picky eaters around 2 years old. At this point, you may have a harder time getting your kids to eat their veggies. For growing vegetarian children who need a lot of nutrients, this could lead to health problems. Give your child a choice (Do you want carrots or peas with dinner?). Having a choice makes the toddler feel more in control and he/she will be more likely to eat the chosen food. Variety! Your toddler may love spinach on Monday night, but by Tuesday it is already boring. Try to mix up your vegetarian meals as much as possible to keep foods exciting. Get creative. If you call broccoli “little trees” or make a face out of peas on the rice patty, your little ones will be more likely to eat healthy foods. Do Vegetarian Children Need Supplements? Children need high amounts of nutrients like iron and calcium to sustain their growth. All children (not just vegetarians) are at risk of some nutrient deficiencies because of their increased needs. Parents should be cautious about monitoring their children’s nutritional health – especially children being raised vegan. Talk to your doctor about your child’s vegetarian diet. You will probably need to have your child’s hemoglobin levels to detect an iron deficiency. Supplements can help ensure that vegetarian children get all the nutrients they need. However, supplements shouldn’t be used to compensate for a poor diet. The best source of nutrients for vegetarians is through foods like whole grains, dark leafy greens, legumes, and fruits. Vegetarian supplements for children generally are safe to take. However, it is still best to talk to a pediatrician before giving your vegetarian child a supplement. Too much of certain nutrients could cause health problems like kidney stones (calcium) or iron overload. I realize that all families are different and my personal insight may not apply (maybe your kid will never complain about eating broccoli and being denied candy). But I think it is important for parents to openly admit that raising vegetarian children isn’t always the piece of whole-grain cake they’d like it to be. After all, vegetarianism is a lifestyle choice and you can’t expect a toddler to understand the basis of these choices, nor the fundamentals of nutrition, at such a young age.